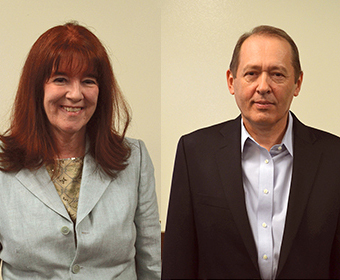 Catherine Clinton and Gelu Popescu are the newest members of the UTSA Academy of Distinguished Researchers. (May 30, 2018) – The UTSA Academy of Distinguished Researchers (ADR) has inducted two new members: Catherine Clinton, UTSA Department of History and Gelu Popescu, UTSA Department of Mathematics. The UTSA Academy of Distinguished Researchers was established in 2015 to select and honor outstanding faculty who exemplify excellence in research; to foster the highest quality of research and scholarly activity by UTSA faculty; and to promote the university’s vision as a premier public research university. The Academy is comprised of researchers across all disciplines who represent the best of research on campus. Each year, the group decides upon the induction of new members. Candidates are nominated by peers across campus, and their body of research work is evaluated. The Academy members review each candidate, looking at all the criteria, and discusses each candidate within the group. “The committee considers a number of factors, including: the impact and the overall quality of the research; the number of citations and publications; publication in highly recognized and leading peer-review journals; recognized works, performances and exhibitions; competitive grants, both federal and international, and funded research; patents; major scientific inventions; editorships; and research recognitions in their field,” explained Hamid Beladi, chair of the UTSA Academy of Distinguished Researchers. This year, two esteemed UTSA researchers were selected for induction. Clinton, the Denman Endowed Professor in American History, has been at UTSA since 2014. She is a pioneering historian of the American South and the Civil War. Clinton is the author or editor of 25 books, including The Plantation Mistress: Woman’s World in the Old South; The Other Civil War: American Women in the Nineteenth Century; Southern Families at War: Loyalty and Conflict in the Civil War South; and Harriet Tubman: The Road to Freedom. Her books Divided Houses: Gender and the Civil War and Mrs. Lincoln: A Life are among several that have been History Book Club selections. Clinton also has written history books for children, presented at numerous academic conferences, and served as a consultant to Steven Spielberg’s film Lincoln. In 2015-16, she served as the president of the Southern Historical Association. In 2016, Clinton received the prestigious Guggenheim Fellowship, which funded her research on how mental illness was diagnosed and treated for Union soldiers during the Civil War. Her research brings fresh perspectives on American history, making it accessible to newer and wider audiences. Popescu, professor and mathematician, is the first inductee from the Department of Mathematics. His research interests include functional analysis, operator theory and operator algebras; noncommutative multivariable operator theory; and noncommutative harmonic analysis and interpolation. He is extremely productive in terms of his research, highly recognized in his field and produces scholarly works of considerable scope and depth. Since arriving at UTSA 24 years ago, Popescu has published on average about three research papers a year in the area of pure mathematics, which tend to run in the hundreds of pages. The majority of these papers appears in the top ranked journals in the field – Advances in Mathematics, Memoirs of the American Mathematical Society (AMS), Journal of Functional Analysis, Proceedings of the London Mathematical Society, Mathematishe Annalen, Journal fur die Reine unde Angewandte Mathematics, and Comptes Rendus de L’Academie de Science. He has published three monographs through the Memoirs of the AMS, the most prestigious U.S. society of mathematics that have cemented his reputation as one of the world’s top experts in operator theory and the foremost scholar in non-commutative multivariable operatory theory. Popescu’s mathematical research has broken new ground and opened entire new avenues for scholarship. Popescu’s work is frequently cited by world-renowned mathematics including Fields medalists. “High-quality faculty is a key component for eligibility into the National Research University Fund (NRUF). This academy serves as a way to recognize such faculty, and the high caliber of research being done at UTSA,” said Bernard Arulanandam, interim vice president for Research, Economic Development, and Knowledge Enterprise at UTSA. The Academy now has 17 members, representing the Colleges of Business, Education and Human Development, Engineering, Liberal and Fine Arts, Public Policy, and Sciences. Learn more about the UTSA Office of the Vice President for Research, Economic Development and Knowledge Enterprise. Learn more about the UTSA Department of History. Learn more about the UTSA Department of Mathematics.